Children are provided with Ken Ham’s excellent Answers in Genesis (AIG) Bible study program. 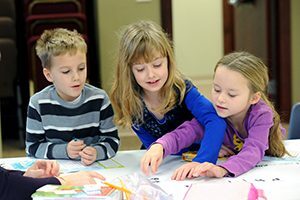 Kids grow quickly and we attempt to make the most of Children’s Sunday School by making the time engaging and fun, while providing an understandable way to encourage them as they learn about God and faith. Children’s Sunday School is for ages 4 through high school and begins at 9:00 AM each Sunday. Infant nursery is provided for younger children.